I will gladly don a big hat if it comes complete with a cocktail. Who am I kidding? I’d easily wear a big hat regardless – to go with my big hair. And then give me a big cocktail. It just sounds so PERFECT. And big. If you’ve been reading my ramblings for a while, then you know that the Kentucky Derby is like a national holiday in this house. This year, SOMEONE gets to go. He is sort of dying of excitement. I’m jealous. I just want a to wear a gigantic hat the entire weekend. Probably going to do that. Last year I made these blueberry mint juleps and, um, HELLO. Life changer. I enjoy a regular old mint julep just as much, but in the spirit of trashing up cocktails in a stereotypical fruity way, I made another one. Pineapple mint. I think I have a hand soap or a body cream that’s made of pineapple mint scent. I don’t know. Inspiration is weird. The key to my favorite mint juleps is crushed ice. It’s seriously makes a huge difference. I throw some regular ice cubes in a blender and pulse because I don’t have a fancy fridge that will give me crushed ice with the push of a button. You must try if you know what’s good for you. Predicament though: I’m not sure which I like more. Can I combine the two? I’m just going to have one (or four) of each. crushed ice, this is key! 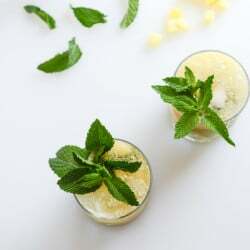 Combine bourbon, mint simple syrup and mint pineapple puree together and shake or stir well. Pour over crushed iced and serve with extra mint leaves. Combine sugar, mint and water together in a small saucepan and heat over high heat until boiling, stirring constantly. Reduce heat to low and cook for another minute or so, then set aside to cool completely. Remove mint before using. You can do this ahead of time and store it in the fridge! In a food processor or blender, combine pineapple and mint simple syrup until pureed. Love that this is a thing.